Increase your safety with this barrier net connector for our BARRICADE 12 x 9 Barrier Net! BARRICADE 12 x 9 Barrier Net: Do not have angry neighbors or broken windows of your own with our BARRICADE barrier net! 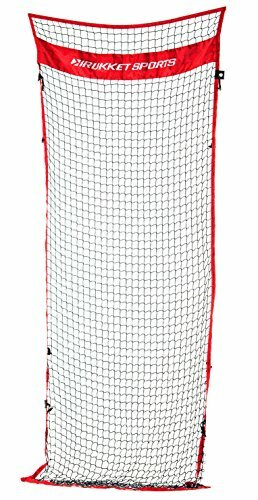 Setup our nets as a system in your backyard to create a SAFE zone for any missed shots. Use it for any sport like lacrosse, baseball, football, soccer, softball and more! Take it to any field or open area and create your own fields. The uses are endless! Our BARRICADE barrier net is 12ft wide and 9ft high. Rukket Tough netting and a quick setup/take down create the ULTIMATE barrier net system. The BARRICADE is lightweight and easy to move around. It features heavy duty 1.4 mm steel base frame and rubber feet for use indoors when splitting up courts. Any questions you may have about Rukket Sports products please contact us directly. Extend the wall of protection with our easy to use 4ft Barrier Net Connector! Protect more space without a gap between barrier nets with our simple design. Easy setup and takedown, fits in the BARRICADE 12x9 Barrier Net Bag. U.S. Based customer service - Five Star Amazon Seller Rukket FAIR PLAY GUARANTEE (30 Day Money Back) - "Always a happy customer"